J. B. Educational Society was formed in the year 1993 by the visionary Sri. J. Bhaskar Rao with the lofty aim of providing quality professional education and meeting the rising expectations of the industry as well as the young students in Andhra Pradesh. J.B.Educational Society has been striding to achieve the objective of excellence in the fields of Engineering, Medicine, Management, Hotel Management and Information Technology. Placements: The main objective of training and Placement cell at J.B.Institute of Engineering and Technology is to provide personal and career related support to the students with special emphasis on training the students on employ ability skills and ultimately provide placement in various Industries/Organizations by arranging campus recruitment drives. 1. To arrange training for the students in soft skills. For this we have allotted 2 hours per week for each section from second year onwards to cover communication skills and Analytical Skills. 2. To arrange Expert Lectures from out side institutions to train on Employ ability Skills. 3. Arrange workshops on GD and Interview Skills. 4. Intract with various Industries and establish MOU’s for Recruitment Drives and also for conducting Seminars to make the students aware of the Latest Trends in various areas. 5. To arrange before each recruitment drive a company/specific training session to make the students concentrate on the specific skills required for that Industry. 6. After completion of each recruitment drive, a feedback session for all the students so as to analyze and make the students aware of the reasons for not getting selected. The following are some of the companies in which the students are placed. Campus: J. B. Educational Society was formed in the year 1993 by the visionary Sri. J. Bhaskar Rao with the lofty aim of providing quality professional education and meeting the rising expectations of the industry as well as the young students in Andhra Pradesh. J.B.Educational Society has been striding to achieve the objective of excellence in the fields of Engineering, Medicine, Management, Hotel Management and Information Technology. J. B. 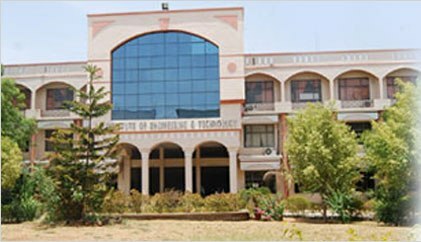 Institute of Engineering and Technology (JBIET), was established by JBES on an expanse of 27.5 acres on the main road at Yenkapally village, Vikarabad main road, Moinabad Mandal, Hyderabad–75, with the approval of All India Council for Technical Education and Govt. of Andhra Pradesh. The college started functioning from the academic year 1998-99, initially with four branches with a total intake of 240 students. The college is affiliated to Jawaharlal Nehru Technological University, Hyderabad. The present intake of the society is around 4000 students that comprises the intake of 1050 Students from JBIET for seven branches, which makes the highest intake among all Engineering Colleges in Andhra Pradesh. Central library: The Library and Information Centre is located in a spacious, well ventilated and illuminated Hall of 800 square meters, volumes including the books in Reference Section 50801. About 206 periodicals and journals (both National and International) and 10 prominent daily newspapers (English & Telugu) are made available in the Library. We are maintaining the SC/ST Book Bank (Volumes: 2526) with assistance of A.P.Social Welfare Department. We have non book printed material, 1170 audio –visual CD’s & DVD’s, 500 video CD’s &DVD and 250 floppies. The total seating capacity of library and information centre is 300. The Library and Information Centre is completely automated and computerized (College Management Software). All the staff and students have free access to internet in the library. We are also providing access to online in IEEE Digital Library transactions. Our college is one of the few institutions in the state to have DELNET (Developing Library Network) facilities providing access to internet library loan system nearly 700 libraries in the country and SAARC Countries. We can access to all International journals through SONET (Society for Networking for Excellence in Technical Education). Adequate Petrographic facilities are available in the Library and Information Center. Hostel: JB Group of Education institutes are providing hygienic hostel facility for engineering students were functioning since 14 SEP 04.We are having separate hostels, which consist of 162 rooms for boys and 96 rooms for girls with excellent facilities. We are having dedicated warden and some of the senior faculties will taking care of hostel residents.